Life right now is a big chaos. We just shifted our belongings and dumped them in the new apartment. With all the last minute work going on there, it’s impossible to live in that mess, atleast not for a super sensitive allergic person like me. Presently I am at my father’s place and in a super bad mood. There are so many things that I want to keep on cribbing about. This is not the life that I ever imagined, no not even in my worst nightmare. There are a lot of things, (some good and some really bad) which are taking place out of nowhere and am almost losing track. All I am trying now is to take things as it come. Amidst all the packing, stacking, shifting, getting things done at the last moment, hopping around with crossed fingers and shouting like a mad woman I dint notice when Autumn tiptoed into our part of the world. Though there is a definite nip in the evening air but the occasional downpours never let the feeling of beautiful autumn to set in. We feel like we are cheated of the beautiful autumn clear skies and pillowy clouds. This morning on my way to the grocer I finally saw some shiuli phul at some neighbour’s garden, a definite sign that the season of Puja is here. 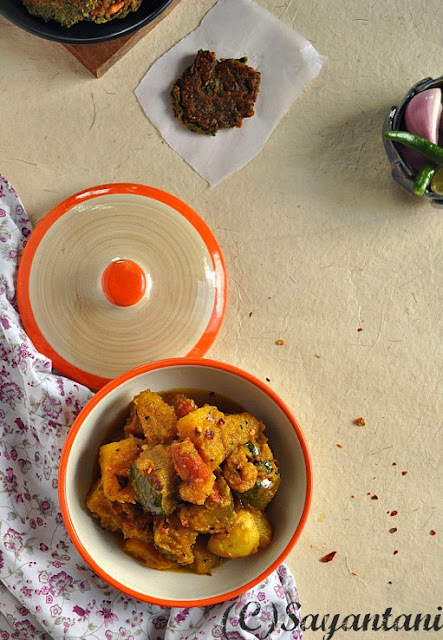 In many parts of the world Fall has settled in at least that is the feeling that I get while reading wonderful recipes featuring pumpkin in the blogosphere. In India not much varieties of pumpkins are available and we hardly use it for making sweets. 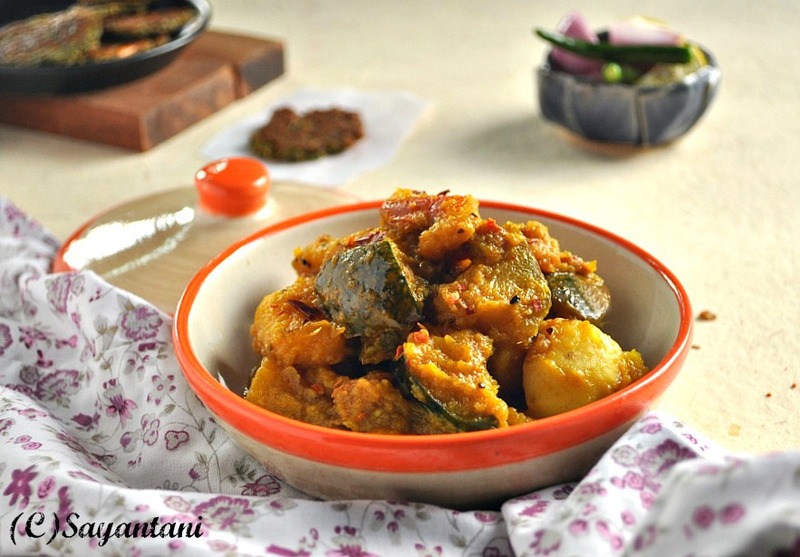 The recipe that I am sharing today is called Kumro botti which is a very simple homestyle dish where the flavour of shrimp creates magic with pumpkin. though this is not served during special sit down dinner but are made in huge batches when families gather together to celebrate some functions like wedding or rice ceremony. Big or special occasions in India definitely means a huge gathering of family and friends. Which does not mean that special day itself, rather guests start to gather a few days prior to the occasions. Depending on the size of the families the number could go upto 100 or more. This calls for a huge preparation especially for arranging the food and the places to stay. Before this trend of apartment living initiated this was not a big problem. Huge pandals or makeshift tents were created in the yard for cooking and serving and friends and nearby relatives happily took in guests in their own houses. Now a days the same takes place in rented halls but the tradition of coming together to celebrate family occasions is still alive. The menu during this period is very simple and is cooked on a mass scale. 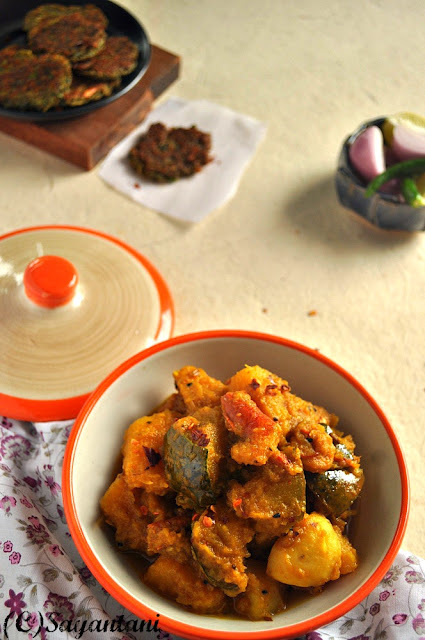 Generally the day meal will incorporate some simple Green leaf curry (shaker tarkari) or a mix vegetable dish cooked with the leftover fish heads, some bhaja (fries), simple dal (lentil soup), fish curry and chutney. Where as the dinner menu will comprise of only one curry, dal and fish or egg curry with some kind of chutney to end the meal. Am talking about all these here because the particular menu that I am sharing today has been picked from such an occasion. Last year we visited my Mama’s place (maternal uncle) to be a part of his grand son’s rice ceremony. Following the trend we reached the little town a day before the program. In our family we generally do not get the food catered by outside caterers. Rather we employ professional team of cooks to cook the food at our premise, yes even the desserts are prepared under the supervision of our family members. The Dinner that night though was a simple affair but was very tasty and comforting. They served this kumro botti dish which we loved. Being a true food blogger I asked the head cook to share the recipe and he happily obliged. So here it is, A light and flavourful fall recipe with pumpkin. Peel and cut the pumpkin in cubes. I used home grown organic pumpkin so on some pieces left the skin. Similarly prepare the potato. Wash and keep aside. Smear little salt and turmeric on the prawn and keep aside for 5 minutes. Heat the oil, preferably mustard oil and when its smoking hot add the shrimps and fry till they turn pink (approx. 1 minutes). Take out and keep aside. In the same oil add the panch foron ad slit green chilies. Once they strat to splutter add the onion paste and a pinch of salt. Fry this on low flame till oil separates, approx. 3 minutes. Now add the potatoes and pumpkins. Mix in salt, chili powder, turmeric, fried shrimps and ginger paste and give it a nice stir to coat everything well. Cover and let it cook on medium flame for 8-10 minutes till the veggies are cooked through. Keep on stirring from time to time. The idea here is to cook the vegetables in its own juice and in that process the juice of pumkin thickens and coats the vegetables. So try avoiding a lot of water. I used a homegrown pumpkin which was very fresh and juicy. Cook the whole dish on low flame and if needed add spoonful of water at a time. Once the veggies are soft add 2-3 tbsp water. Crank up the heat a little and stir to combine and bring together all the flavours. 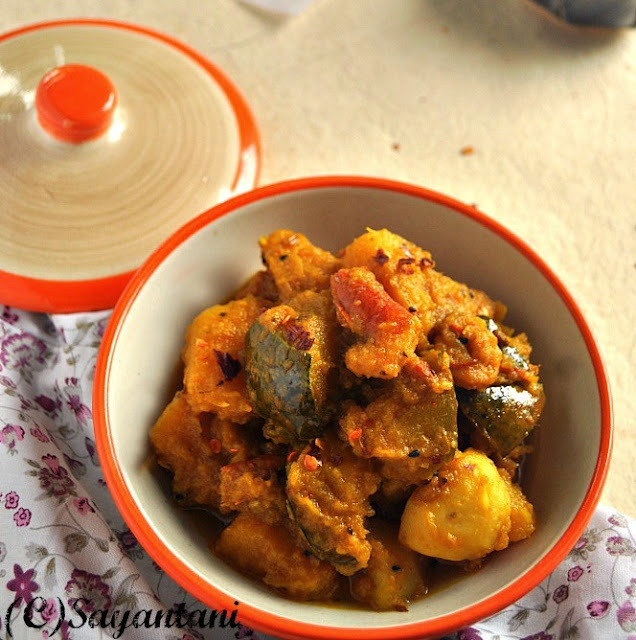 Serve hot with steamed rice or homemade rotis. This tastes equally good without shrimps. Try adding soaked Black chickpeas. Please do not remove the head of the shrimps, thats where all the flavour and taste lies. Even sometimes we cook this particular dish with all the leftover shrimp heads after making stir fries and so. Now that I have tasted butternut squash and find the texture and taste quite different to our humble pumpkin I would not suggest using that. The taste would differ in that case. Bon Vivant#9; simply sides at Sumee's culinary Bites. Wow tempting curry,looks so delicious. Very delightful combo Sayantani. You made and presented it very perfectly. Barir kotha mone porche. Sarodiyar priti o suvechha niyo. Never had this combo. Looks colourful. Quite a new combo for me, looks irresistible and makes me hungry. Love Indian recipes. Would love to try this with pumpkin. In Japan which city? delicious curry. Love your recipes! I have to try to make with as I love pumpkin but never made it with onion paste. Wish you all the best for the move and change in life. But I love the idea of mixing pumpkin with seafood or mayb even chicken...will giv this twist a try soon!